Is new Creator dropping color mgt on PNG files? Not sure if this is an issue yet. Can other people test please? Make a box of some color - anything. Orange, green, violet... and save it as a JPG. Load it on a new face. Then save the same box as a PNG (24-bit) and load it in the creator as well. Are they the same colors? I noticed the PNGs are losing something... saturation? vibrance? can't quite put my finger on it but PNG file colors somehow load "duller". Anyone experience the same thing? 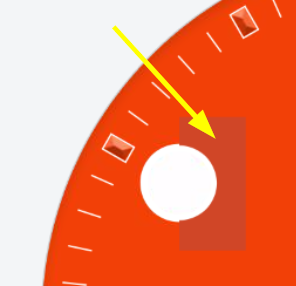 In the image below I was in the middle of making a "shield" to hide the circle when it moved right. The background face and the shield should have been exactly the same color. I've never seen this prevously. 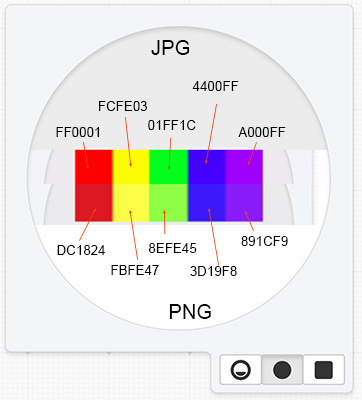 Looks like PNG >> JPG... 50x50 pixels, scaled up in Facer Creator to 240x240. The "problem" John, is not located to the PNG File format, but as a "problem" by the JPG file handling, of compressions. 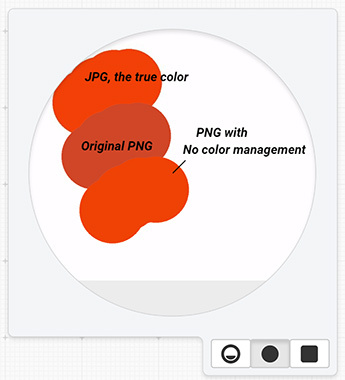 PNG is a so called Lossless file format, and do not loose any kind of color, saturations or similar. But JPG do, because of it's compressions technique. And besides, the more times you open and save a JPG file, the more it will loose of Color "robustness". Everytime, it loose a bit of the Colors it have. So PNG is to use, to be sure not to loose any Color. The only issue with PNG, is that it can be pretty big in Size! yup I gotcha. But there's something else going on - maybe I messed up my PhotoShop color management for PNG-24s somehow. I took a screenshot of Pei-Hsin's image above and brought it into photoshop. I cut off a slice saved the slice as a JPG and as a PNG and loaded them back into the Creator. You can see they are not the same, but they are for Pei-Hsin. 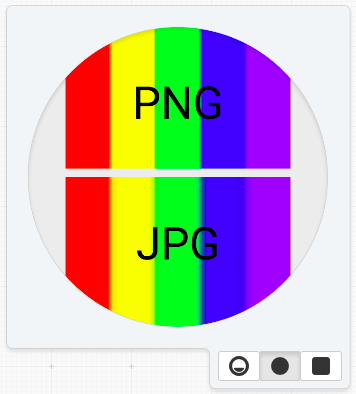 If the PNG format is completely lossless then why am I not getting exactly the same color on PNGs when I load them in the Creator? For JPGs, what I make is what I get - dead on, every time. Anyway the fact that Pei-Hsin's image is equal-equal means the problem is my own. I'll have to deal with it. 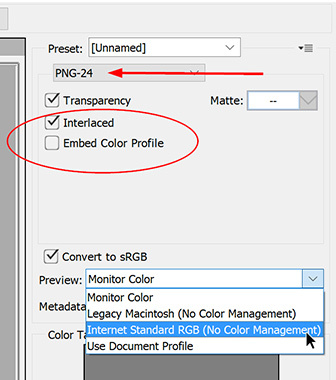 But in reality, it should be so, that not any Browsers should be able to change colors in a PNG file (it's a part of the ISO standard for PNG files). So if you provide you'r Color profile, or not, should in reality, be without any meaning! I "look" more to you'r Tick mark in "Convert to sRGB", as an explanation. But I don't use Photoshop, so I can't say it is so. True that @post. In fact, I tried the same as sRGB is "standard RGB". but that check mark didn't do anything different. Still, the RGB standard is three sets of 2-byte numbers in base-16 hexadecimal so 255 x 255 x 255 is like a 16 million+ count pile of colors. I can't imagine picking a color that's not covered in that color set lol. So, I'm not surprised the sRGB made no difference in this case. However, once I saw it, I figured the embedded color management "stuff" like iCCP, or whatever, etc has an effect. I don't know (or care) what these color management inserts do, but at least I can turn them on and off. no, I think the injection of PS's color management "stuff" when exporting PNG files was the problem. Thanks for this post, @jmorga106. I ran into this color management issue again while making banners for my collections. Thought I was losing my mind when I couldn't produce a true red!! Wow how about that @pacingpoet! Glad you found this post. Sometimes it takes me forever to find a post I swear I've read before - or I never find it and figure I must have dreamt it.